Legends of Tomorrow has been churning out top-notch, feel-good episodes since season 2, but it’s never better than when it takes a deep dive into one of its lovable misfits and figures out what makes them tick. In “Tender is the Nate” it was, of course, Nate’s (Nick Zano) turn to resolve his lifelong conflict family conflict with the help of the Lost Generation, a Minotaur, and a James Taylor song. Meanwhile, the Time Bureau engaged in a delightfully makeshift girls’ night courtesy of Nora (Courtney Ford) and Ray’s (Brandon Routh) star-crossed romance. No new romance here, folks. “Tender is the Nate” had two distinct storylines running, but they were both connected and managed to affect each other throughout the night. The episode bega with Mona’s (Ramona Young) enthusiasm over her first day at the Bureau being promptly squashed by Ava’s (Jes Macallan) no-nonsense attitude. Ava reminded her newest employee that the creatures were prisoners not guests and showed off various creatures trapped in their cold prisons with no real comforts. While this outlook fit with Ava’s strict personality, it was especially disconcerting when directed at Nora, who had been so warmly received by Ray and even Constantine before. Ava got her own warm reception at the office when Sara (Caity Lotz) arrived to provide a seductive birthday present. Unfortunately their romantic rendezvous was rudely interrupted by Hank (the excellent Tom Wilson) and his line item complaints for the Waverider. But Legends of Tomorrow made up for the lack of romance by mining a ton of humor out of Sara using her ninja skills to remain unseen by by the elder Mr. Haywood. Hank then demanded that Nate take him on a ride-along to prove whether or not the team is worth their budget, and true to form, Nate’s old roommates were more worried about him seeing Charlie (Maisie Richardson-Sellers) than they were about their funding. Despite being distracted by a naked and meditating Constantine (Matt Ryan), the reunion couldn’t be put off any further. But when Nate hugged ‘Amaya’ in his joy, it merely earned him a punch in the face from Charlie. These may all seem like minor moments, but the culmination of them was what made “Tender is the Nate” such a great episode of television. Even before the 1920s Paris backdrop made an appearance, it was an hour full of well-earned character beats and humor worthy of a Brooklyn Nine-Nine episode. But a monster did eventually attack Paris, and that was when Nate’s filial insecurities and Hank’s obsession with Ernest Hemingway became a surprisingly important focal point of the episode. My face when I saw how little Zari there was. Wowed by Hemingway’s drunken swagger, Hank rejected Nate’s game plan of returning to the Waverider with a Salvador Dali drawing to figure out which monster they were up against. So while Nate wallowed in his father’s disapproval, Hank went on an alcohol-soaked hunting trip with Hemingway, Mick (Dominic Purcell), and Sara to keep them alive. The younger Heywood did eventually figure out that the creature in question was a Minotaur, thanks to Charlie and a guest appearance from the Fitzgeralds, and then discovered that a lute would lull her to sleep just in time to prevent a massacre of the Lost Generation in France. Sara got to display her impressive leadership skills once more when she backed her team member without alienating their sponsor, and by the power of Nate and Hank’s musical talents combined, they put the Minotaur to bed with an excellent rendition of James Taylor’s “Sweet Baby James” and the dulcet tones of a father recognizing his son’s abilities. 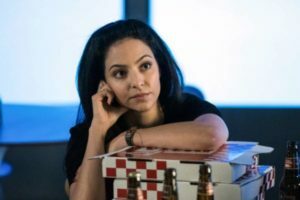 Back on the Bureau side of things, Ray made his way there to visit Nora precisely because he, Zari (Tala Ashe) and Constantine were deemed extraneous to the mission. While Ava would not broker a meeting between the two, Mona was all too happy to pass along a letter for “my generation’s Ross and Rachel,” which may have been too superlative a title. Nora, however, was not emotionally equipped to deal with a love letter from Ray yet and accidentally caused a magical ruckus which left her, Ava and Mona trapped together in the containment cell. 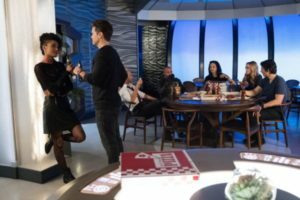 Mona’s brand new employment was in imminent danger until a heated conversation about parents led to a night of drinking and birthday cake, in which all three of the actresses perfectly balanced the humor and heartbreak of escaping a cult, being a clone from the future, and rejecting Yale’s offer for law school. They eventually convinced Nora to open the letter, but instead of glitter and heart stickers they found Ray himself in miniature form. He may have accidentally stuck himself inside, but the fact that he went through so much trouble warmed his beloved’s heart. The adventure made Nora more open to corresponding with Ray and, more importantly, made Ava more open to showing the caged creatures some humanity. “Tender is the Nate” ended with the eponymous ex-member bidding the rest of the Waverider adieu, which was bittersweet but probably not the end for him since he’s got plenty to do in the Time Bureau. It was an almost entirely self-contained episode of Legends of Tomorrow, but that was what made it all the more memorable. Besides, the two-part midseason finale should give fans plenty more plot to grab onto.